Ceramic Glass has a thermal expansion close to zero and can resist temperatures up to 800°C. This make it ideal for high powered flood lights, IR-heaters, fire protection and heat shielding applications. It is also used in doors for wood burning stoves and fireplaces. 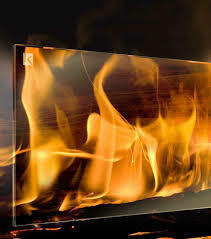 We can supply this in sheets or cut to size as replacement ceramic glass in your wood heater. Also available as Optical discs and plates for use in telescopes. Ceramic Glass has many registered trade names; Keralite®™ ; Neoceram®™ ; Robax®™ ; FireLite®™ .